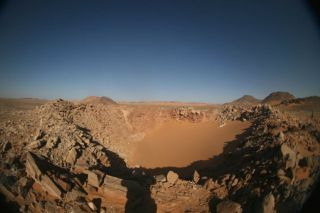 Fish-eye picture of the 45-m-diameter Kamil Crater, southern Egypt. Full story. NEWYORK - Space rock aficionados from around the world are converging on New York Cityfor the biggest ever meeting of the Meteoritical Society this week. Morethan 500 meteorite experts from around the world will convene at the ParkCentral Hotel here for five days of presentations and discussion on topicsranging from the age of our solar system, how planets become habitable, and howoften large meteoroids hitplanets like Earth. The space rockmeeting begins in earnest Monday. TheMeteoritical Society is a non-profit organization that promotes the study ofextraterrestrial materials, including meteorites and other samples returned from space. ?Aftermany decades of great science, the international members of the Society arelooking forward to coming to New York for the second time to hear aboutinteresting new research and discoveries in extraterrestrialmaterials,? said Hiroko Nagahara,professor at the University of Tokyo and president of the Meteoritical Society,in a statement. ?I am also looking forward to awarding the highest honors fromour Society.? Amongthe awards that will be presented this year is the prestigious Leonard medalwhich will go to Hiroshi Takeda of Japan?s Chiba University for his analysisof meteorites as pieces of Mars. ?It?swonderful that so many international scientists can come to New York to sharetheir research and discoveries,? said Denton Ebel, curator in the Department ofEarth and Planetary Sciences at the American Museum of Natural History andchair of the Meteoritical Society?s Local Organizing Committee. ?The cityprovides the perfect cosmopolitan environment to stimulate discussion,collaboration, and new ideas." TheAmerican Museum of Natural History will also host the conference?s BarringerInvitational Lecture. Sean Solomon, the principle investigator of the NASA's MESSENGERmission, which will study the planet Mercury. Solomon will present newdiscoveries that this spacecraft has already made, and will others that it isexpected find when in orbit around our solar system's innermost planet.